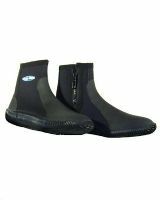 Our zip up wetsuit boots are highly durable quality boots that provide extra warmth in the water and offer protection, comfort and grip for use in a range of water sports. Boots are available to fit UK adult foot size 4-12 (subject to stock). Our Blue Rush deluxe wetsuit boots are manufactured to a high standard. They are made from 5mm neoprene and have flat locked stitching for strength in the seams. They zip up on the inside at the ankle. The sole and toe are reinforced with rubber for additional grip and durability.